This dish is like the incredibly delicious lovechild of two Italian classics: Lasagna, and Chicken Alfredo. It was simply amazing. Not to mention, it only requires 6 ingredients! I love that these are individual servings. That’s probably not a big deal to some of you, but I just enjoy dishes that are made to look pretty as a sing serving dish. Maybe it’s because of the tragic sense of loss I feel when I cut a square of lasagna and all that beautiful melted cheese on top just slides right off as I place it onto the plate. I was always the kid who said “Wait a second, that’s MY CHEESE that slid back into the casserole dish! It came off of MY square of lasagna!” Obviously, losing cheese has always been a big deal to me. Anyways, these little rollups really are amazing. I had leftovers for lunch and ya know what, the leftovers tasted as good or better even than the fresh ones! Don’t ask me why. 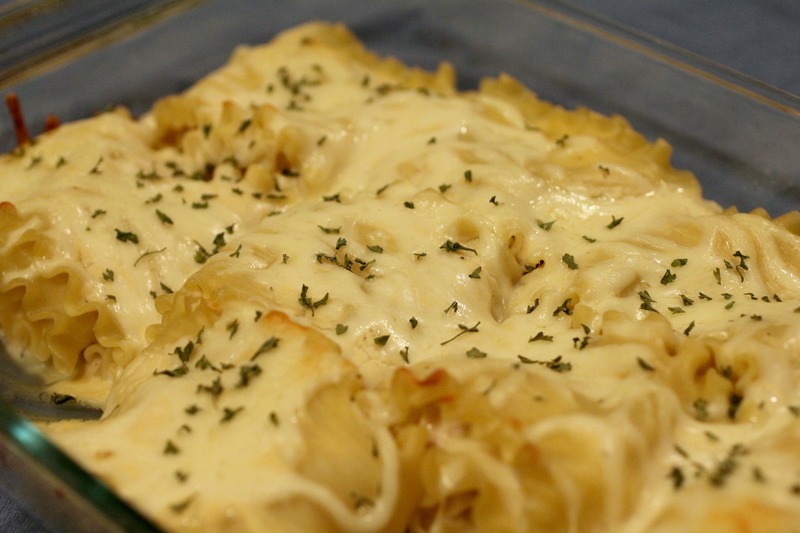 But the sauce and the cheese and the pasta all just make this a great comfort food dish! If you like chicken alfredo, you will love it! 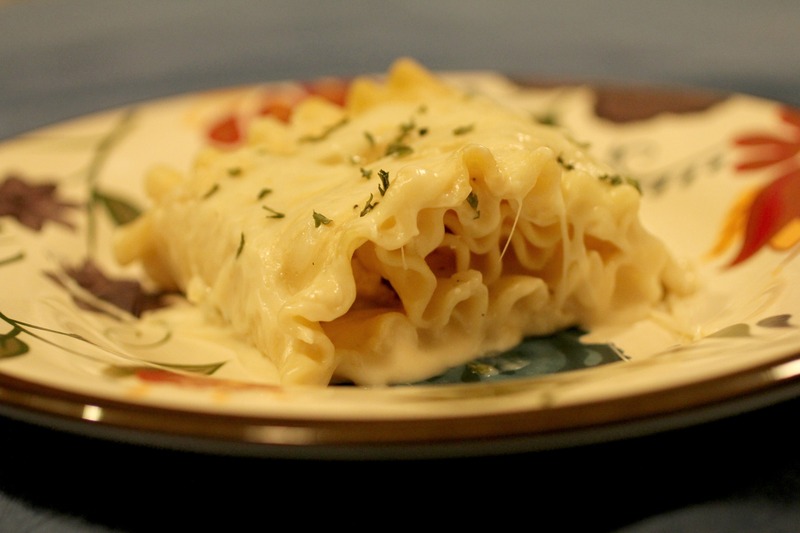 Spray an 8x8 pan with non-stick spray and pour ½ cup alfredo sauce, or just enough to cover the bottom of the pan. Boil 8-10 cups water in a large pan, cook lasagna noodles until al dente. Drain and rinse the noodles with cold water to prevent them from sticking to each other. Then, lay out each noodle individually and blot dry with a paper towel. Spread about 2 Tbs. alfredo sauce over each noodle. (if there is too much sauce you will have a big mess on your hands!) Sprinkle oregano and garlic salt on top of sauce. Take 1/9 of the shredded chicken and spread it out evenly over each noodle. Add approx. 3 Tbs. cheese to each. Carefully roll the noodles one at a time and place them seam-side down so they don't come undone. Once they are all in the pan, pour the remaining alfredo sauce over the top. Top with remaining cheese. Bake at 350 degrees for about 30 minutes, or until the cheese is completely melted on top. These just made me hungry!!! Thanks!